Tom Simmons was recruited from Northcote Juniors. A superbly built 6-footer, he was a star junior all-round athlete, winning the 100 and 200 yard championships of Melbourne Technical Schools, as well as the high and long-jump titles. He also won the 220 yards dash at the Inter-Technical schools championship at Olympic Park. Later, the warm days of summer were filled by playing seconds for the Carlton Cricket Club. 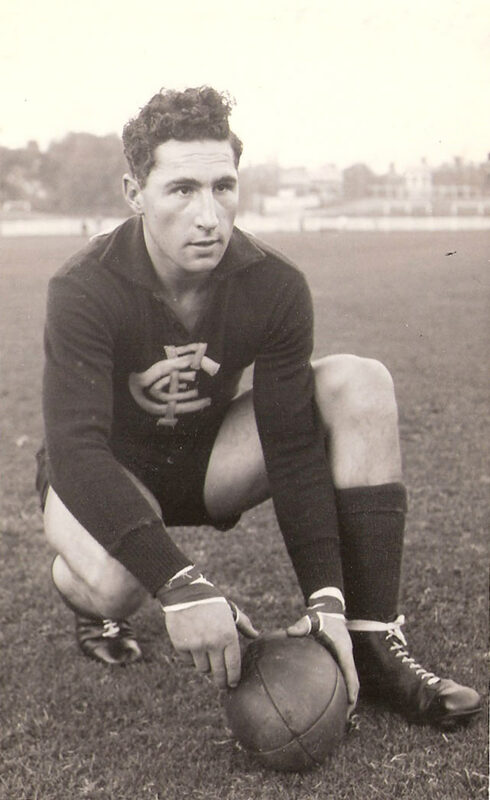 Tom amassed an impressive 27 games in just two years, playing mainly on either the half back or half forward flank for the Blues - all before the age of twenty one. During this time Tom’s display of impressive pace, long kicking, high marking and a determined appetite for the ball made him a difficult opponent for opposition teams. Laurie Kerr opined, "He looked and performed like Mighty Mouse on the field." Umpire Harry Beitzel referred to young Simmons on the field as ‘champion’. The future looked bright, Carlton had just played off in a Grand Final, a strong team full of champions pointed to a bright future, and perhaps Tom might soon also rise to the lofty level his potential suggested. Then in a pre-season game before the 1950 season, a knee injury tragically struck down the young athlete. However, Tom was determined to return. 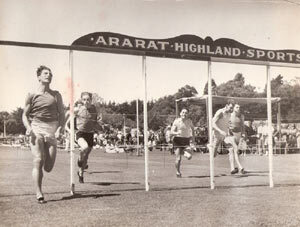 After two knee operations, full fitness eventually returned to the point where in the professional running season over the summer of 1950-51 Tom won the Terang, Ararat and Maryborough Gifts within a few short weeks. Then a decision had to be made; to continue on the lucrative professional running circuit (albeit off shorter marks) for events such as the Bendigo 1000 and Stawell Gift - or attempt to resurrect a fledgling footy career. Tom chose to return to his beloved Blues, aiming to fill the hole left by the retirement of champion full forward Ken Baxter. Regular track watchers soon observed the young Simmons at training, taking spectacular marks over seasoned veterans such as Bert Deacon and the towering Jack Howell. With pace to burn, and a strong pair of hands, the position of full forward seemed a natural progression for Tom. It is not clear what happened next; perhaps it was the demands of the lateral movement of football rather than the straight running of sprinting that pressured an already weak knee, or perhaps it was the sudden rise of freakish goalkicker Keith Warburton - but sadly, Tom never got to play another senior game for the Blues. Tom married his sweetheart Lorraine the following year, and forged a successful career as an industrial chemist working for companies such as Revlon and Estee Lauder. Tom and Lorraine raised a family of seven children, and Tom regularly attended Carlton games with his family for years after his football career ended. Simmons also wore Guernsey No. 18 during the 1952 season but he didn't manage to play a senior game that season. Contributors to this page: molsey , Bombasheldon , PatsFitztrick , tmd1 , true_blue24 , WillowBlue , Jarusa , p(12)terg , dgreen2 and admin . Page last modified on Tuesday 08 of October, 2013 21:58:39 AEDT by molsey. 1996 Rd 15 - Kernahan celebrates after goaling. 1996 Rd 7 - Fraser Brown.